Of course, discussing third rail this early in the story is jumping way ahead. When plans for Grand Central were being made up, they knew that they needed to use electricity – but it had not yet been decided how exactly to do that. Overhead wires and third rail were both contenders. Each of the two aforementioned systems has its pros and cons – overhead wires keep electric far away from the public, carry electricity better and require fewer power substations, though are susceptible to high winds and extreme temperatures, while third rail requires more substations, but is more hardened against weather issues. 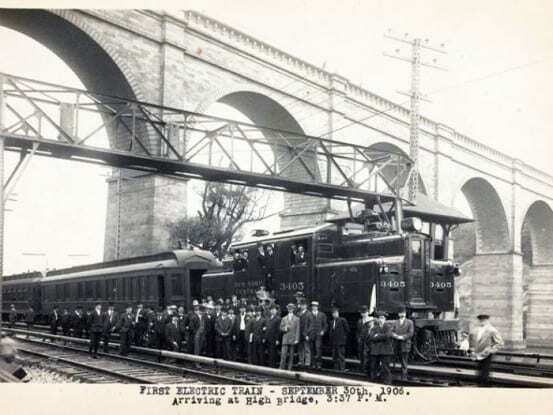 To debate the issue a committee called the Electric Traction Commission was formed, consisting of the New York Central’s Chief Engineer William Wilgus, two other senior railroad engineers, and three outside electrical engineers to serve as consultants. However, even before deciding on the way the trains would be electrified, the committee needed to decide where exactly they would be installed. Initially debate circled around just satisfying the demands of the city – removing steam from Manhattan island and nothing more. 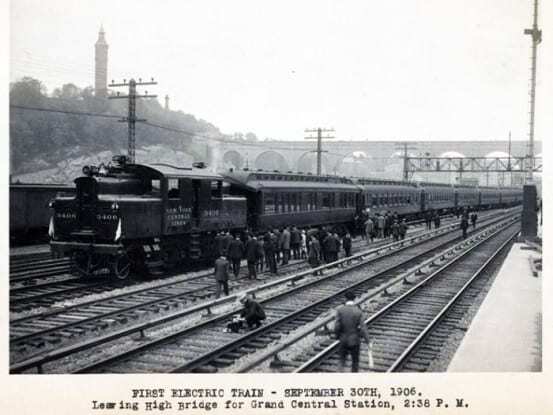 Under this plan, electric trains would operate from Grand Central to Mott Haven, in the Bronx, where trains would be switched back to steam power. Wilgus, however, was far from a timid man, and always envisioned plans on a massive scale. He instead pictured an “electric zone” stretching 33 miles along the Hudson from Grand Central to Croton-Harmon, and 23 miles on the Harlem to White Plains. By that date, few other systems had already electrified, and those that had were relatively short distances. In all, including multiple tracks and yards, the project would require 292 miles of electrified rail. For comparison, the entire tally of electrified rail in the world at that date was 212 miles. This one project would consist of more electrified track than currently existed in total across the globe. Wilgus was a bit of a visionary, able to see how the railroad would grow, and what was needed to encourage that growth. His “electric zone” would be a boon to the steadily growing commuter traffic into Grand Central. 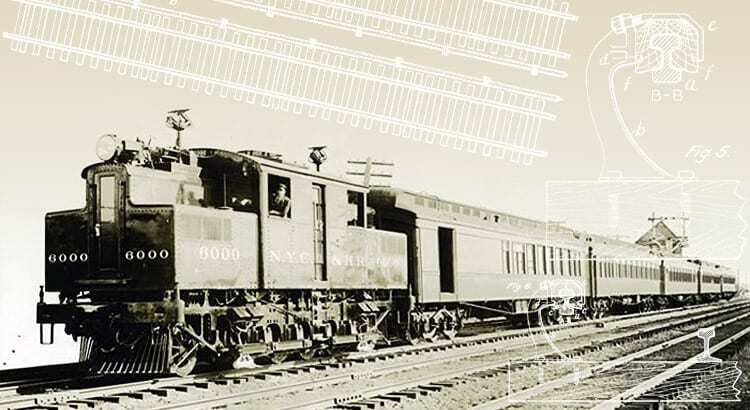 Steam locomotives had difficulty serving the commuter zone quickly and efficiently due to their slow acceleration, exacerbated by the fact that there were so many stations, all located close together. Wilgus sold his electric zone plan the same way he sold Grand Central Terminal with his air rights plan – by citing the revenue that would be returned to offset what would have been too hefty an investment. Though the initial electric trains were pulled by electric motors, Wilgus and Sprague also came up with a plan for electric multiple unit cars, which are the bread and butter of electrified roads like Metro-North and the LIRR today. As the puzzle pieces all began falling into place, one last major decision was whether to use Direct Current, or Alternating Current – something that was highly politicized at the time. The Westinghouse Corporation promoted AC, while General Electric advocated DC. Though AC would have been far superior over long distances, no one was quite sure it would be able to handle the immense load of Grand Central’s train traffic – thus the decision was made to go with DC. As part of the contract with General Electric, the first electric engine was to be completed in under a year, and a four mile electrified track to be set up outside Schenectady for testing. 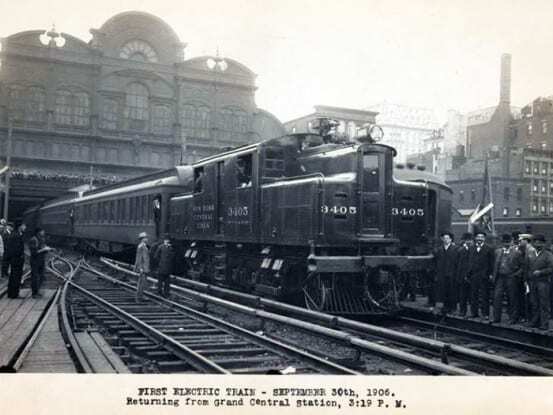 By September of 1906, years before the Terminal would be completed, electric trains were being tested into Grand Central Station, and by the end of that year a few electric trains were on the regular schedule. The New York Central had kept its promise to eliminate steam locomotives from Grand Central. While the story could, of course, go on further from here, I’m going to stop here and share a few photos from William Wilgus’s collections (housed at the NYPL) of the first electric trains. If this subject (and Wilgus himself) interests you, be sure to check out Grand Central’s Engineer: William J. Wilgus and the Planning of Modern Manhattan by Kurt Schlichting – it’s quite a good read. I’ve been looking for just such a thorough explanation ever since news reports referred to an “under-running” third rail. Thanks! By the way, I always thought the term “third rail” was a misnomer since, obviously, trains run on just two rails. 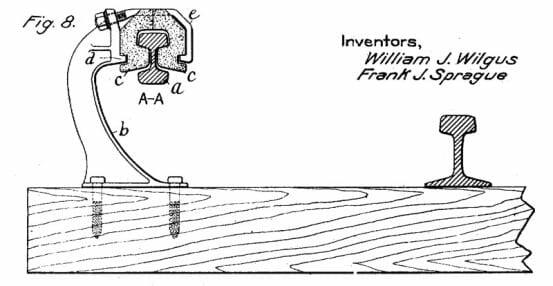 But from that patent diagram it looks like the third rail was an actual rail. I can understand how that would be economical but were (are?) rails really used as the “third rail”? It seems to me that what you want in a rail (strength) isn’t necessarily what you want in an electrical conductor (conductivity). Yeah, it is definitely a rail. Check out the photo of Vienna’s third rail which gives a really good look at it. Looks rather expensive, compared to the Wilgus system. Think of all the beer cans they could make with that aluminum. Most modern 3rd rails are hybrid aluminum and steel construction. Steel for wear and contact surfaces, and aluminum for conductivity. Considering that Aluminum is more reactive than steel (iron), the low-conductive oxide layer builds rapidly, and will result in frequent repetitive passivization via oxidation cycles whenever a train with 3rd rail shoes passes over. This may lead to rapid wear on both the shoes and the rails, and generate significant amounts of abrasive aluminum oxide dust. It may also lead to greater electrical losses, as the current must flow through partially broken layer of aluminum oxide whenever a train passes. Additionally: Aluminum is softer than Iron, thus exposed aluminum wears more readily. Aluminum Oxide is harder than Iron Oxide, thus 3rd rail shoes wear faster. Actually, modern 3rd rails are aluminum with a wear resistant stainless steel contact cap. NYCT 2nd Avenue will use a 6000A aluminum stainless steel 3rd rail at 1/3 the weight and 40% of the resistance of traditional 150lb steel rail commonly used by NYCT. Its easier to install, does not wear like steel or steel/aluminum rail and is more efficient as a conductor (saves $.) MNRR’s Park Ave line will be converted to this rail in the near future. Throughout Europe, Asia and the Middle East, aluminum stainless steel 3rd rail is the standard. The US has been slow to adopt this technology. The ‘third rail’ rail is an “I”-rail, as opposed to the “T”-running rails. It is steel, for economy vs. copper/brass, and much lighter weight. With the DC system, sub-stations are not far apart and conductivity is not a big factor. On the NYCentral system, they were covered by milled wooden insulation (now plastic) and normally wouldn’t ‘zap’ you if you stepped on them (not recommended). Sometimes miscreants drove nails through the wood. Not nice, but the DC would repel you. Doing the same, with an AC contact, would weld you to it. That is why the AC systems were suspended in overhead catenary, away from trackworkers and trespassers. The DC systems operate on +/- 750 volts. The AC systems at 11,000-15,000 volts. Addendum/correction: some DC systems used catenary/overhead. City street cars and interurban railways come to mind. The Milwaukee Road (CMStP&P) electrified its Pacific Extension (two segments) with 3,000V DC overhead, and its Great Falls (MT) Terminal with 1,500V DC catenary. Butte, Anaconda & Pacific (MT) electrified with 2,400V DC overhead. Some city streetcars, notably in New York City, used a center-of-track ‘third rail’. Current was picked up by a ‘shoe’, riding in a slot between the rails, under the pavement. I believe the specific type of third rail that everyone flipped out about in CT was center track too. Interesting factoid: NYC’s Third Avenue Railroad had transition points, from overhead trolley to center third-rail pickup shoes/plows. They had a dugout/foxhole/observation room, under the street pavement. A guy sat there and made sure the “plow” properly engaged the subterranean power rail. Cool job, no? The Delaware, Lackawanna & Western Railroad (DL&W) also used DC current at 3,000 volts to power its New Jersey suburban services from Hoboken to Montclair, Gladstone, and Dover, NJ. This electrification was in daily service until August of 1984. Thomas Edison was reputed to have led the first electric train out of Hoboken in September 1931. Hence the trains were affectionately known as the “Edison electrics” until their retirement in 1984. I rode on those trains as a child in the 1970s. A bit off-topic, but another kind of third rail was used, that being dual-gauge trackage, where two different gauges met ( eg. 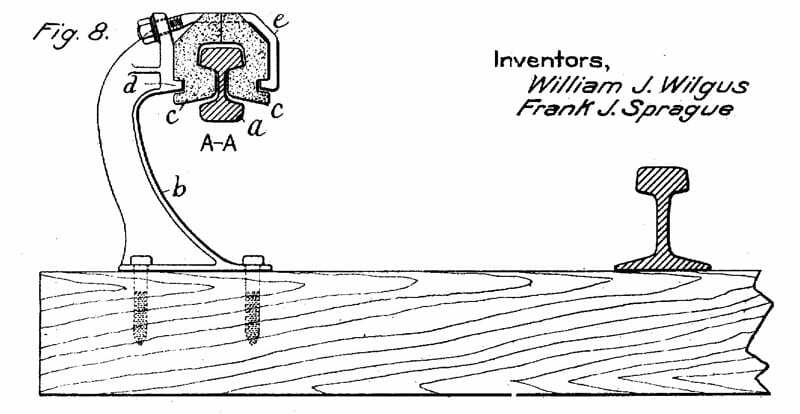 a standard gauge [4′-8.5″] and a narrow gauge [3′-0″] converged. One of the three rails was common and the other two offset the appropriate distance. Sorry for the babbling. ‘Cabin Fever’ has set in! 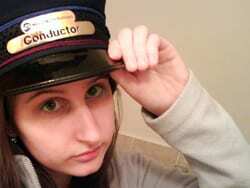 Thanks for spreading the back story of the third rail beyond the community of historians and fans. There was a second Philadelphia property – the Philadelphia & Western – built with Wilgus third rail, and the Central California Traction also used it. The former converted to overrunning third rail, and the latter dieselized. Thanks much! I knew there were definitely some others out there that used the Wilgus/Sprague method! The P&W did start with under-running third rail and converted to over-running. However, it never went diesel, and uses electric cars to this day. It is now known as SEPTA’s Norristown High Speed Line. The third rail on SEPTA’s Market Frankford Subway Elevated line is under-running, while its Broad Street Subway is over-running. The subway-surface trolleys use overhead wire and trolley poles. I was on the Century of Third Rail tour, the last “true” group tour that MN has done. Great to see the underpinnings of the power infrastructure. Even got a small piece of the third rail as a memento. Of course you are correct. This driver was at fault. Very well done, Emily! Beware Charles “Chuck-the-Schmuck”/”Photo-Op”/”Chuckie ‘Say Cheese'” Schumer! He won’t like you! Don’t leave your camera at home! Photo Op? I thought it was Saturday Session Schumer. Good job. I learned a lot. Very informative post, Emily. The early New York Central electric motors, i.e. S-class, had small pantographs in front of the cab. Can you confirm whether these were used to draw power from an overhead rail when locomotive-hauled trains passed over the switch clusters leading to GCT? As a kid, I was taken to the Russian (Soviet era) exhibition at the NY Coluseum at Columbus Circle (no longer extant). There was a cutaway display of the Moscow subway, and I noticed that the Moscow Subway, too, used underrunning third rail. I imagine it still does, since a changeover to overrunning would be costly and would seem to have no purpose.